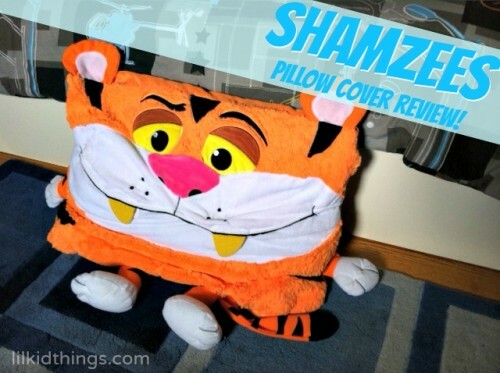 I recently had the opportunity to review a Shamzees pillow cover. You may have seen the commercials for this “as seen on TV” product, advertising these “pillow eating friends”. They are brightly colored animals or monsters that act as a decorative pillow cover, stuffed animal, trusted friend. Basically, anything your child can dream up! We were sent the Tiger cover and I think it is adorable. For the first few nights, Oscar insisted on sleeping with it, but we had to flip it over to the non-decorated side for comfort. Still, he thought it was great! Of course, as four year olds often do, he is learning to take things apart, so I keep finding all of our pillow cases and shams removed in the morning. But the little tiger isn’t going anywhere and I think he makes a great addition to the room! The only thing I might change about these pillow covers is the material, which is synthetic. For decorative purposes, this really isn’t an issue, but if my son continues to want to sleep on it, I would love a sturdier fabric made from natural fibers. I am glad we had a chance to check out this product. I don’t typically order ‘as seen on tv’ items so I loved having the chance to check out the quality of Shamzee! Disclosure: I received the above product for the purposes of my review. All opinions are my own.